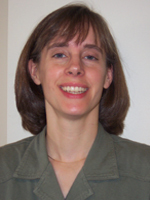 Anna Mitchell received her undergraduate degree in Biochemistry from Swarthmore College and graduated from the MD-PhD program at the University of Michigan. Her graduate work was done in the laboratory of Dr. Francis Collins studying the function of the Neurofibromatosis type 1 protein, neurofibromin. She completed a residency in Pediatrics at the Children's Hospital and Regional Medical Center in Seattle, WA and a Medical Genetics Fellowship at the University of Washington. During her fellowship she worked in the laboratory of Dr. Peter Byers, studying the role of type V collagen in classical Ehlers-Danlos syndrome. Dr. Mitchell studies the genes that encode the chains of the type V collagen protein (COL5A1 and COL5A2) and the connective tissue disorder that results from mutations within them, classical Ehlers Danlos syndrome. This disorder is characterized by joint hypermobility, skin hyperextensibility, and abnormal wound healing. Other features not consistently seen in every patient are scoliosis, orthostatic hypotension, aortic root dilatation, premature degenerative joint disease, and easy bruising. iii) studying the effects of two variants within the COL5A1 gene on patient phenotype. The first of these is a G to A transition that results in substitution of a serine residue for a glycine at position 530 of the protein. The second is the alternative splicing of exon 64, which appears to have a tissue-specific pattern in mice, with some tissues utilizing exclusively exon 64A and others using the two isoforms in equal amounts. Effects of pregnancy on the renal and pulmonary manifestations in women with tuberous sclerosis complex. Mitchell AL, Parisi MA, Sybert VP.